Whether you're heading off for a sunny beach vacation, going for a swim in the pool nearby, flying out for a relaxing escape in the mountains, or you're hitting the local favorites, here are some tips for easy outfits that you can all summer long. 2. The striped tee: another great classic; a light and airy tee is great for comfort; the long sleeve can be substituted for a short sleeve if the weather calls for it. 3. Skinny Jeans: make sure you pick a comfortable pair if you plan to be doing a lot of walking, sightseeing or hiking! 6. The backpack: a day of sightseeing calls for a backpack; this one has several pockets and lots of room. Cute and functional is the way to go! Love this! I'm heading to the beach next week, so this is perfect! Beautiful - all of it!! Great collection. Awesome all of it and I love these. Thanks for sharing here. They're all gorgeous, but I think The Adventurer is my favourite. 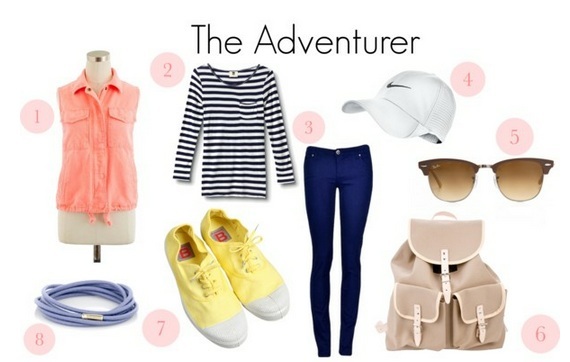 Though I do love that satchel...Loving the packing tips as well!